………but what`s the tale behind it? Well, as a relatively new recruit to the running game in later life I seemed to get on better on the uphills in XC races, and that stirred a thought in the recesses: “I`ve heard of that thing called fell running, wonder if that happens in Scotland?”…….googles…….ah, Scottish Hill Runners……and they have a championship of 6 races over the year, your best 4 results to count…….and one race has already taken place this year, but that leaves 5, so still possible…….and when`s the next one………next Saturday at Screel (where on earth is that? )……..ah, okay down there, that`s doo-able……..right SHR Championship, you`re on, I`m going for it……..potter down on a beautiful day, park up some B road in the middle of nowhere, go to a tent, enter and get a number……..£2, that seems very fair and reasonable………don`t know a soul………and we`re off……..up, up, up, up……..guess what David, it`s a hill race, that`s what happens……..but once up there`s a lovely run along a path with some beautiful views over the Solway Firth…….I`m thinking, I could get to like this…….ah, we`re on the way down now……oh my God, no, we`re climbing back up again……ah, at last, looks like it`s all down now…….across the line, legs a bit wobbly, but basking in some beautiful Spring sunshine, a cup of juice laid on, and there is a warmth in the company too, plenty of smiles and pleasant grimaces exchanged as legs are loosened off……….and this chap in a funny custard like semmit (for it is Hamilton Semple of this parish) spots a Garscube Harriers vest and says, in a friendly way, “I didn`t know they had any hill runners”……….they don`t, but maybe they do now……..off to the Solway for a dip, and back up the road, tired, but happy…….thinks, that was good, wonder if there`s anything else on outwith “the championship”……….ah, yes there is………in fact next Wednesday there`s one called the Whangie Whizz, and it`s close by…………and so began a 21 race summer! That was then, but this is now. 10th anniversary of my first ever hill race, and guess what, the Champs are back to Screel, and so am I, to celebrate my anniversary where it all began………and it`s another beautiful day just as it was 10 years ago……the stunning physical specimen and gentleman that is the organiser V70 Dougie Milligan tells me that this is the 27th running of the race, and that it never rains! After an active but very low mileage winter I remain true to form by “start loitering” and end up with a gentlish induction as I am held in check by the volume of bodies, but as ever that also let`s me immerse into the race gradually (I prefer the assessment that says this is a physiological choice, as opposed to me being a lazy b), working away, get past a few including one of my domestic V60 rivals Don Reid (don`t worry he`ll chase me down on the descent, I`m thinking) and could see another, Gordon McCaffrey, not too far ahead but I`m not making up any ground up, tho` it`s early season and getting ahead of him not to be expected. Dip down off the summit and along the trail to that wee sting in the tail sharp, but brief, incline; local man Craig Malcolmson appears in front of me, and I know from carpark chat that he was up reccying last week, so let`s just hang onto him for as long as I can so that I don`t have to think about lines. It works for a while but eventually he pulls away, and I am left on my own, dropping down through a forest section, jumping over tree roots at speed with eyes darting looking for the soft peaty earth on either side to cushion the joints on foot fall, all the while dappled in sunshine through the branches……my god, I really do love this, and no wonder……….and can`t be too far from the finish so I can float down this last stretch in comfort……but oh no I can`t, as I turn a corner who`s there in front of me but Gordon McCaffrey, oh well there goes the relaxing 1k finishing stretch…..the only way this is going to work is if I batter past him and keep the foot down……..lungs starting to sear, body creaking, don`t think I can keep this going much longer……..oh good, there`s the last bend……and in and home. And Gordon congratulates me, but says that due to my ungentlemanly conduct he`ll not be giving me a lift home, which threat he immediately has to withdraw when he remembers that it was me who was driving us :-)…. and all the post race chat flows, prize giving takes ages, Ruth has scooped 3rd lady and I`ve got a couple of beers for 3rd V60 (would have been wasted on tee totaller Gordon anyway) and back to the car park where I dispense my anniversary chocolate fridge cake to those still around……and it`s off in search of the Grey Mare`s Tail Pools in the Forest of Galloway for a dip, but the search is taking too long…..Ally messages that they`ve had to give up…..it`s getting cold, ah well Gordon and I will just make do with a leg soak in a loch……and off up the road to Ayr and home…..Gordon provides a running commentary about all the hills and all the bothies therein, and we have 3 stops for Gordon to take pictures of stunning wee churches…….all of which activity brings home just how much interest and discovery there has been for me in my foray into the hill running scene over and above the physical endeavour of the actual races themselves, and indeed the camaraderie of all those custard vested folks, of which I am now one after the aforementioned Don R had suggested when chatting at the end of a 2010 Glenshee 9 that I run for Westerlands in the hills and Garscube on the flat…….so you`ve got him to blame! ……no results out yet, but looks as though I was about 38 minutes, and you`ll see from the opening line that that`s about 20 secs slower than 2009, but I can live with that, I most definitely can. Brilliant report DD. But how do you manage to only lose only 30secs over 10 years!! I was about 6 mins slower then 2004. Is it less training and more beer & dancing??!! Ah, JD, your last sentence reveals my well (or maybe not so) kept secret. 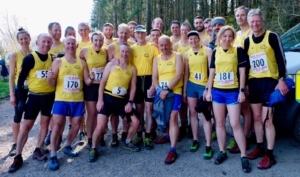 Great Report David, and great run on Saturday. Enjoyed that David. Well done on 3rd.